Yes, we’re a bit late to the Destination Eurovision party, but we’re making up lost time with three of the competing songs in our Top 5 this week, including this track from Emmy Liyana. It’s strong, and it’s anthemic, and it’s the type of song that gets in your head regardless of whether you want it there or not. After listening to the studio versions of the Destination Eurovision songs, Louka’s is one that stood out to me more than most. The melody is incredibly catchy, and we really love the mixture of French and Italian. We’re all about a fusion! Still addicted to the Middle Eastern sounds of Basim’s music, demonstrated by the fact he has three songs in our Chart Toppers this week. Like we previously said, we love a good fusion, and we suspect Basim will be a Chart Topper of ours for a while to come. This song really has been a highlight of the last few weeks, and finally we get the hype around it. Yes, we were late to the party but better late than never. The melody of the chorus especially is an earworm, and we’ve caught ourselves singing the tune on numerous occasions! The charm never dies, as this is the third Chart Toppers that Basim has featured both with this song and Comme Ci Comme Ça which was mentioned in this week’s Top 5. We don’t have much to say other than we still really love this song! Although dominated by French songs this week, we’re still hanging on to the Italian vacation vibes by holding on to this song. The harmonies these two create are magical, especially in that last minute and a half. This song is definitely one of the best songs to come out of the 2018 Eurovision national final season thus far, and we think it might be hard to top. Although only at number 8 this week, this song has definitely been getting a lot of love – all night long. After collaborating with Basim on his song Comme Ci Comme Ça, it was only a matter of time until we crossed over into the world of Gilli, another Danish artist who has dabbled in the Middle Eastern beats. This was our entry into the music of Gilli, but we think you might be seeing more of him in future Chart Toppers. This is our token Italian rap song of this fortnight, as we’ve lost some of our Italian rap tunes to the new additions this time around. This song is short, but it certainly packs a punch, and it’s a song that we just can’t get bored of, no matter how many listens. Although not too impressed with the Swiss selection, there were two songs that caught my attention, with this bop of a tune one of those songs. Yeah it’s a bit cheesy, but it’s just a feel good pop song with a catchy chorus. It’s jumped down a bit this week due to the new additions to our charts, but don’t be mistaken, this song is still very much on our radar. Again, it’s an addictive chorus that we can’t get enough of, no matter how many times it pops up on our playlist. Basim gets three out of three this week, with all of his latest singles making our Top 20. Admittedly, this is the single that we didn’t quite have love at first listen, but the more we listen, the more we start to love this tune. Another big drop in the charts Is Tequila and Lemon, and it’s not that we enjoy it less, it’s more the fact that the new songs have been listened to more in the last fortnight. It’s still definitely a current favourite just because of the incredibly addictive beat! Not long to go until we can finally hear LIAMOO’s Melodifestivalen entry, and we really hope it’s as good as this modern but moody track from the young star. Only time will tell, but for now we’re still enjoying this track! We need Måneskin to hit up Sanremo next year, because if there was ever a perfect band to present a spectacular at Eurovision, it’s these talented young musicians. Listening to this song constantly is such a reminder of how big their future will be, especially if they keep releasing songs like Chosen. It was a hot favourite to take out Destination Eurovision, and although we had other favourites, this track had huge Eurovision potential. It’s a contemporary pop track with the perfect mix of languages, and although it’s been left behind at the national final, it’s going to remain a favourite among fans for a while to come. Incredibly, the Swiss have chosen a modern and alternative track to represent them at Eurovision this year, and we couldn’t be happier. It might need a bit of work before the contest, but the studio version of the song has been getting a bit of airplay on the Eurovision Union playlists. This is that type of radio friendly pop tune that we can’t help but fall in love with as it has all the elements that make a great song. It has the verses which build into the hard hitting choruses where we see Isabell’s voice shine, plus it’s catchy enough to sing along. 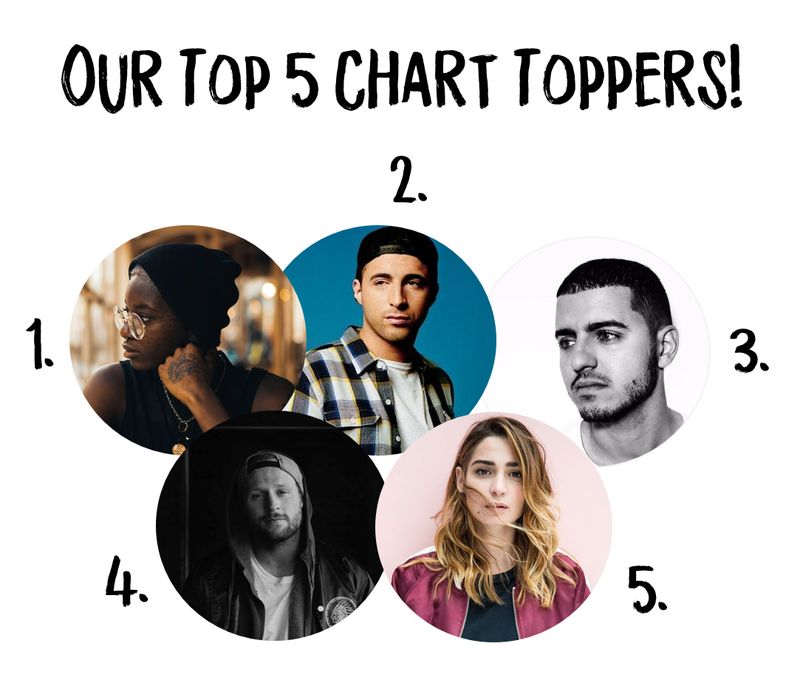 A great addition to our Chart Toppers! France’s selection for Eurovision this year is so typically French. It’s a slow burner, but although not as punchy as some of their other Destination Eurovision songs, it’s got a charm that is hard to ignore. We’re loving the anthemic end of the song, and if it creates the same visual effect at Eurovision as it did at the national selection, they’re in with a strong chance. Listen to the Songs in the Danish National Final Now! Melodifestivalen 2018: Listen to the Semi-Final 2 Snippets!